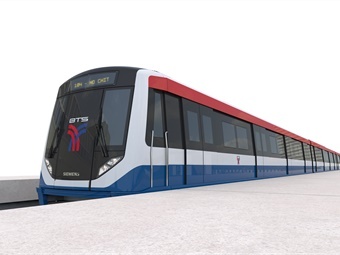 Bangkok Mass Transit System Public Co. (BTSC) placed an order with a consortium of Siemens and the Turkish public transportation vehicle manufacturer Bozankaya for the delivery of 22 four-unit metro trains. In addition, Siemens will take over their service and maintenance for 16 years. The trains will be manufactured at the Bozankaya factory in Ankara, Turkey. The Siemens scope includes the bogies, traction and braking systems, auxiliary systems, as well as the project management, development, construction and commissioning of the trains. Delivery of the first metro trains is scheduled in 2018, and the order will be completed in the following year. The trains will operate on the existing BTS (Skytrain) system and the Green Line extensions. The Siemens Mobility Division conceived and implemented the first three high-capacity mass transit rail systems for Bangkok that are the basis for the system's further expansion. The BTS Skytrain elevated train system from Siemens was the first rapid transit system to be built in the Thai metropolis and has substantially reduced private transport since its inauguration in 1999. The current two extension projects are adding to the south of Sukhumvit Line with seven stations, and to the north of Sukhumvit Line with 16 new stations, to increase the network's total length to around 42 miles. The south extension from Bearing to Samut Prakan is scheduled to be completed by the end of 2018. The north extension from Mo Chit to Khu Khot is planned to begin operation by 2020.